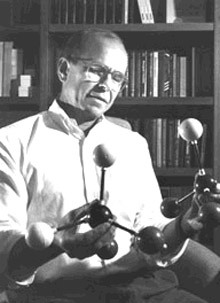 American chemist K. Barry Sharpless developed stereoselective oxidation reactions, and showed that the formation of an inhibitor with femtomolar potency can be catalyzed by the enzyme acetylcholinesterase, beginning with an azide and an alkyne. He discovered several chemical reactions which have transformed asymmetric synthesis from science fiction to the relatively routine, including aminohydroxylation, dihydroxylation, and the Sharpless asymmetric epoxidation. He won the Nobel Prize for Chemistry in 2001, for his part in the unraveling of chiral catalysts — asymmetrically engineered molecules that do not structurally mirror themselves, a breakthrough that has enabled researchers to selectively control chemical reactions.